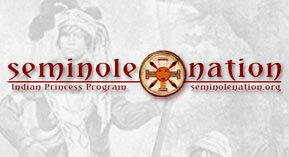 What is the Seminole Nation Indian Princess Program? The Seminole Nation Indian Princess program is for fathers that want quality, planned, one-on-one time with their daughter. The program is open to every Dad with a child from Kindergarten through 7th grade (and then some.) Participation in activities for the father and daughter is a vital part of the Seminole Nation Indian Princess program. Fathers and daughters share in events, games, crafts, outings, and camp outs. The father observes their daughter�s relationships in the group; see�s the daughter�s strengths and needs, which creates a basis for helping their daughter to grow. Likewise, the daughter observes their father interacting with other dads and daughters. This provides the girls with an important role model. The program is designed to build and strengthen the father/daughter relationship by providing intentional opportunities for a pair to create lifelong memories together. Seminole Nation Indian Princess begins at about Kindergarten and continues to about 13 years old. Some daughters finish the program a little earlier and some a year later. A strong bond is developed between the girls of similar ages and among fathers too. We suggest that a strong tribe consists of all age eligible age groups. Older girls have an opportunity to mentor younger girls within their tribe. What if I don�t have a tribe yet? If you are looking for a tribe, the Seminole Nation Indian Princess Nation Officers will work with you to join a tribe. Every tribe is a little different and we want to match you with a tribe that will allow her get the most out of the program. Ideal tribe sizes have about 15 fathers in them. You may join anytime by completing the Join Indian Princess form on the About Program or Contact menu above. When do we join the program? If you are not attending an event as a guest of a member, you must have joined the program before attending an event. You may join anytime by completing the Join Indian Princess form on the About Program or Contact menu above. Once you've submitted the request to join a Seminole Nation officer will ask a tribe chief to invite you to a tribal meeting. At the Tribal Meeting you and your daughter(s) will meet the other dads and daughters in the tribe, and typically build a craft and have snacks. Nation Event (see Princess Calendar) registration is only open during a window of time leading up to the event day. Annual Program Registration: Most Nation events require that your Annual Registration be in effect and not expired. On the Event registration page you will be prompted to renew your annual membership if it will expire before the event you're registering for. Annual registration is not collected or offered outside of the Nation Event registration process. When do we officially register for the program? The annual Program Registration officially begins when you register for your first Seminole Nation sponsored event. You will be required to complete the annual Program Registration online during the individual event's online registration process. Completed Program Registrations are valid for one year. The nation's event registration system will automatically check for a valid annual Program Registration and ask that you renew only if your current Program Registration will expire before the event date. Any questions on registration can be directed to the Seminole Nation Indian Princess Nation Chief via email here. Program Registration fees are not based on how many children you have in the program. The fee is a per family fee. The fee covers one program year. See the above question for additional details. What do the father and daughter do in the program? The Indian Princess program is ACTION-ORIENTED! Fathers and their daughters form tribes. Tribes contain anywhere from 10-15 fathers and their daughters. The tribe selects one father as tribal chief, along with various tribal positions delegated to the fathers. Typical volunteer tribal positions are Tribe Chief, Tribe Medicine Man, Tribe Wampum Bearer and Tribal Property Keeper. Throughout the year tribes will attend their own tribal events plus attend Seminole Nation sponsored events. The major Nation sponsored Spring and Fall Camp outs will include the Induction and Breaking Arrow Ceremonies. At your daughter's first spring or fall camp out she will be individually honored by both current and past program Nation officers who will welcome them into the program. Additionally, girls reaching their mid-teens who are ready to leave the program will participate in the Breaking Arrow ceremony. During this ceremony there isn't a dry eye in the audience...but luckily the daughters are there to console their dads. It is suggested that tribes meet twice a month for about an hour. We recommend one formal meeting that can be held at a tribe member’s home or community center of their choosing. The other meeting can be a fun outing in the community such as hiking, fishing, or going to an event together. For ideas see Tribal Ideals under the main menu above. How is this different from Girl Scouts? The Seminole Nation Indian Princess program is designed to be a father and daughter relationship building program. Scouts focus on kids having fun with other kids while parent’s main role is with facilitating and safety. What are the benefits of participating in the Seminole Nation Indian Princess Program?